NEW! 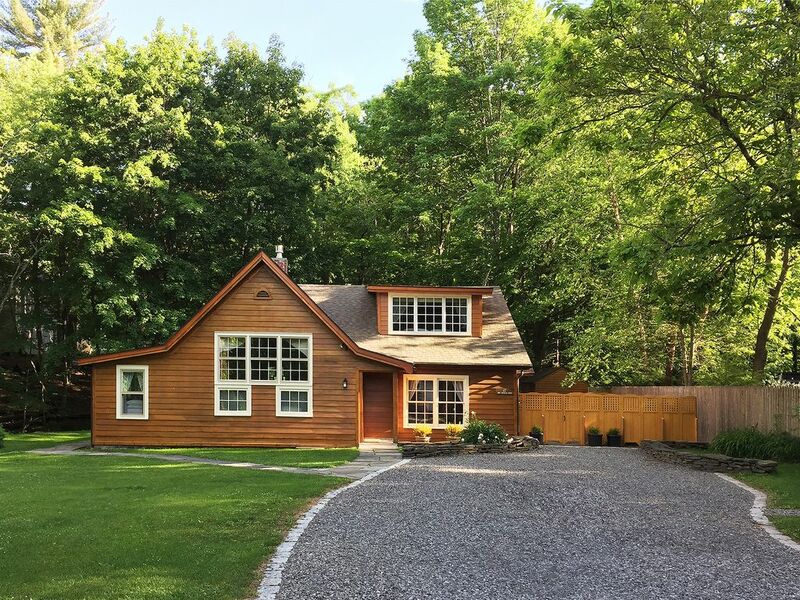 Beautiful luxury getaway in "the most perfect location in Woodstock"
Brook Cottage is ideally located on a shared and secluded property at the end of a private lane, yet it’s just a few blocks from the center of Woodstock and the NYC bus (no car needed). You can walk to Woodstock’s wonderful restaurants and cafes, galleries and shops, theaters and clubs, hiking trails and swimming holes ~ or you can just stay home and relax in your own private oasis of peace and beauty. Brook Cottage occupies the east wing of an authentic 1928 artist’s residence/studio, and features oversize north-light windows (with views of Overlook Mountain, the highest peak in the region) and a south-facing wall of glass with forest and brook views. Step through the historic old-growth-pine front door into the spacious living room featuring a 16-foot cathedral wood ceiling with skylights, dramatic 2-story north-light artist windows framing Overlook Mountain, and a gas-fueled fireplace with a double-height exposed fieldstone chimney. When the weather is chilly, you can start a cozy fire in the fireplace with the flip of a switch, and snuggle on the sofa with your honey ~ or on the overstuffed armchair with a book (perhaps selected from the collection in the wall of built-in bookcases behind you). When the weather is warmer, use the remote control to open the screened skylights and let in fresh mountain breezes as well as melodic birdsong. On hot days, you can turn on the air conditioning and run the overhead ceiling fan to create your own cool breezes! Curtained hallways on either side of the stone fireplace lead to a 25’ wide light-filled open plan "great room" (kitchen/dining/lounge area) with a south-facing wall of glass that overlooks the private back lawn, conservation forest, and meandering year-round stream that flows between them and right past your stone patio. You can relax on the slipcovered sofa or overstuffed armchair in the lounge area to admire the view and perhaps spot wildlife. Blue herons and ducks occasionally visit the stream, rabbits and chipmunks are frequent visitors, and across the stream you may spot a doe and her fawns. Or you can turn on the gas-fueled fire stove (also with the flip of a switch) and settle in by a cozy fire to watch a movie on your large flat-screen “smart TV”. Your brand new cook’s kitchen is fully-equipped for you to prepare simple snacks or elaborate meals. It features a Caesarstone quartz countertop, walnut cabinets, a quiet Miele dishwasher, and new stainless steel appliances, including a Bosch gas cooktop and conventional/convection wall oven, as well as all new matching sets of dishware, bakeware, pots and pans, cutlery and utensils ~ there’s even a Kitchenaid stand mixer for baking! The adjoining dining table seats 4. Or you can grill and dine al fresco on your bluestone patio with a Weber gas grill and outdoor table (also seats 4) under the trees and next to the stream. At night, climb quiet carpeted stairs that run behind the central chimney to the second story master bedroom in the spacious sleeping loft with a railed balcony overlooking the living room below. Stretch out on the queen bed with 100% cotton luxury linens and non-allergenic duvets and pillows under a large triangular-shaped window and skylights with views of the stream, woods and stars ~ or close the remote-controlled blackout shades to sleep late into the morning. With a skylight or window open, you can fall asleep to the soothing sound of the flowing brook. The bedroom also features a quiet AC, as well as a rocking chair sitting area. On the first floor (next to the bathroom) is a second, smaller bedroom with a full bed and 100% cotton luxury linens and non-allergenic duvets and pillows, east-facing windows with views of the stream and woods (and blackout shades), and a remote-controlled AC. The bathroom (located on the first floor) has a tub with a windowed rain-shower (and stream view), as well as a unique polished tree branch shower curtain rod and curved teak countertop. Plush 100% cotton spa towels and a hairdryer are provided. Your flat-screen TV is “smart”, providing both full cable service as well as internet access. Likewise, high-speed WiFi service is reliable and strong, as is cell service for all major providers (Verizon, ATT, etc.). Brook Cottage was built in 1928 in the traditional “Woodstock-style” as part of the thriving arts community. Over the years it has been lovingly renovated/updated and beautifully furnished/decorated by the designer-owner and a master craftsman with great care and attention to detail, as evidenced by the hand-plastered walls with softly rounded corners; natural woodwork and Douglas fir floors refinished to a silky sheen; state-of-the-art systems and appliances (including highly efficient and quiet ACs, dishwasher, and large front-load washer/dryer); 100% cotton luxury bed linens and plush bath towels, etc. In other words, Brook Cottage shares and upholds the same high standards of design, quality, comfort and luxury as Brook Cottage Too, the much-loved and highly popular 5-star rated vacation rental (#4230126) that occupies the west wing of the building and shares the driveway and parking area. Although Brook Cottage and Brook Cottage Too are totally separate and independent semi-detached rentals (with separate entrances on different sides of the building, and private patios and outdoor spaces also on different sides of the building), and both are ideally suited for romantic getaways and personal retreats, they may also be rented together by groups of friends or extended family members who want to be together while still maintaining their own private spaces. Brook Cottage is easy walking distance (just 5-10 minutes) to everything the village of Woodstock has to offer: artisanal ice cream, mountain bike rentals, popular restaurants and cafes, galleries, boutiques and specialty shops, live music and theater performances, hiking trails and swimming holes, etc. In other words, you don't need a car! Instead, you can take the Adirondack Trailways bus from NYC or NJ to the Woodstock village green, and walk just 5 minutes to Brook Cottage, your luxury Woodstock getaway at the edge of the village! We’re happy to answer any questions you may have, either before booking or during your stay. We look forward to hearing from you, and welcoming you to Brook Cottage for a peaceful and romantic getaway! Well-behaved and crate-trained dogs are considered ~ please ask. Please note that a $75 pet fee per dog applies. A thirty day notice is required for cancellations. All cancellations are subject to a 10% cancellation fee or $100.00 (whichever is greater). Cancellations that are made more than thirty days prior to the arrival date will receive a full refund, minus the cancellation fee. Cancellations that are made within thirty days of the arrival date forfeit the full payment. Early departure does not warrant any refund of rent. If you think there's any chance that you may need to cancel your reservation, we strongly suggest that you consider purchasing travel insurance to protect your trip. Thank you! I'm a local Woodstock artist focusing on portraits in pastel and oil. I also manage a number of vacation rental properties in the Woodstock area. I am very selective about the properties I represent, and ensure that they are well-maintained, immaculately clean, and very welcoming and comfortable. I am enthusiastic about the area, and happy to help in any way I can. I look forward to hearing from you! A year-round stream flows through the back of the property + right past the cottage! The land on the other side of the stream is a protected + "forever wild" conservation easement. Dining area is open to kitchen and sitting/TV area with cast-iron gas fire stove, AC, wall of glass overlooking lawn and year-round stream. Outdoor dining area on patio with gas grill also seats 4. Smart TV with basic cable service and internet access for watching movies on Netflix, Amazon, etc. I am not one to write reviews but this is our second stay and it was perfect...again! Coming back was like coming back to our own house. Can't wait to come back again. This cottage was amazing with high-end details, cozy (incredibly responsive) fireplaces and a perfect location that felt secluded but just steps to town. The surprise snow made it a Winter Wonderland and the vibe and magic of Woodstock can't be described. Highly recommend! I have stayed in this house the last four years, and I will keep coming back. It is beautifully maintained and wonderfully comfortable. It's a great location for town. My new favorite bar, Station Bar & Curio, is practically next store. I can't say enough great things about it. This will be the second time My Wife and I stayed in Woodstock for a weekend getaway. Fortunately for use they were both Judy Atwood properties. The house was amazing everything was modern and spotless. We had our Cavalier Maggie with us so we planned on cooking and staying in. I'm the cook and a bit of a pain when it comes to the tools of the trade so I usually bring some basic tools and ingredients with me. Upon arrival I went through the Kitchen and left my stuff in the car. Judy and her staff have taken a lot of time trying to anticipate any needs you may have through out the house and have done a wonderful job. The house is just past the edge of town tucked away down a private lane. The property has a great backyard the patio and grill were perfect. The upstairs bedroom holds the heat so we opened the windows and skylight and it was very comfortable and a bonus of the sound of the brook lulled us to sleep. It is a nice walk into town great not having to look for parking. I look forward to our next visit. I do not know where to begin, to recap this beautiful stay we enjoyed at Brooks Cottage Too...it was simply a dream come true. In fact, I would say the cottage could easily be featured in Architectural Digest, it really is that stunning! The photos literally mirror the actual experience and capture it PERFECTLY. We loved cooking dinner in the contemporary kitchen with everything you could possibly need from the pots & pans to plates, glassware and every utensil imaginable (seriously, it inspired me to come home and remodel our kitchen the same way!). Our favorite time was probably cooking dinner in the evenings and then sitting outside on the patio looking at the clear sky and the stars that shined so brightly. Of course, equally enjoyable was getting up in the morning, making a wonderful pot of coffee and sitting outside, listening to the birds and water running in the brook just beyond the backyard... yes, this is real & not a dream! The community...its just as magical. The people are so friendly, the boutiques and galleries beautiful (loved Candlestock & Sparkle boutique) and the dining simply lovely. Must admit, because we purposely wanted to stay nearby we did not venture out much but we did enjoy a fabulous dinner at Cucina (excellent cuisine and relaxing, romantic atmosphere). There are so many other dining locations on my list, I can't wait to come back to visit! Of course, this has become a special place in our heart not only because we enjoyed it so much but so did our Australian Shepherd... never seen her so calm (lol...and those who know Aussies, know this is a major accomplishment!). I am forever grateful to Chelsea, Judy and the Brooks Cottage Too owner for their kindness, professionalism, warmth and EXCELLENT customer service. I must admit, a small part of me hates to give such a glowing review for fear we will have a hard time coming back to our very own "enchanted garden"
Woodstock is a historic + thriving arts community ideally located in the foothills of the Catskill Mountain Park, halfway between the spectacular high peaks to the west + the Hudson River valley to the east. You can explore the surrounding mountains by car or on foot/bike via scenic drives or an extensive network of hiking trails ~ many of which follow pristine mountain streams with waterfalls. Discover why the natural beauty of this area inspired the 19th century romantic art movement known as the Hudson River School with it’s oversize panoramic landscape paintings, + why it has attracted such visionaries as the founders of the Byrdcliffe Arts Colony (the oldest operating arts + crafts colony in America), Maverick Concerts (the longest-running summer music festival), the Woodstock Sound-Outs of the 1960s, and of course the 1969 Woodstock Festival of Music + Art. Woodstock continues to be a haven for artists, musicians, writers + spiritual seekers, as evidenced by the many galleries, studios, music venues, + monasteries in the region. As such, it is widely considered the cultural hub of the area. SURCHARGE Please note that rates are for 2 people. Please add $25/night surcharge for each additional person (maximum occupancy is 4 people). PETS Well-behaved and crate-trained dogs are considered ~ please ask. Please note that a $75 pet fee per dog applies. CANCELLATIONS AND REFUNDS A thirty day notice is required for cancellations. All cancellations are subject to a 10% cancellation fee or $100.00 (whichever is greater). Cancellations that are made more than thirty days prior to the arrival date will receive a full refund, minus the cancellation fee. Cancellations that are made within thirty days of the arrival date forfeit the full payment. Early departure does not warrant any refund of rent. TRAVEL INSURANCE If you think there's any chance that you may need to cancel your reservation, we strongly suggest that you consider purchasing travel insurance to protect your trip.